The last time I was at quilting we were trying to complete this one. We all were squeezed in tight, knees and elbows touching to try to get the quilt done before we closed up at 3:00pm. But we didn’t manage and then Cathryn came in later and finished it on her own. 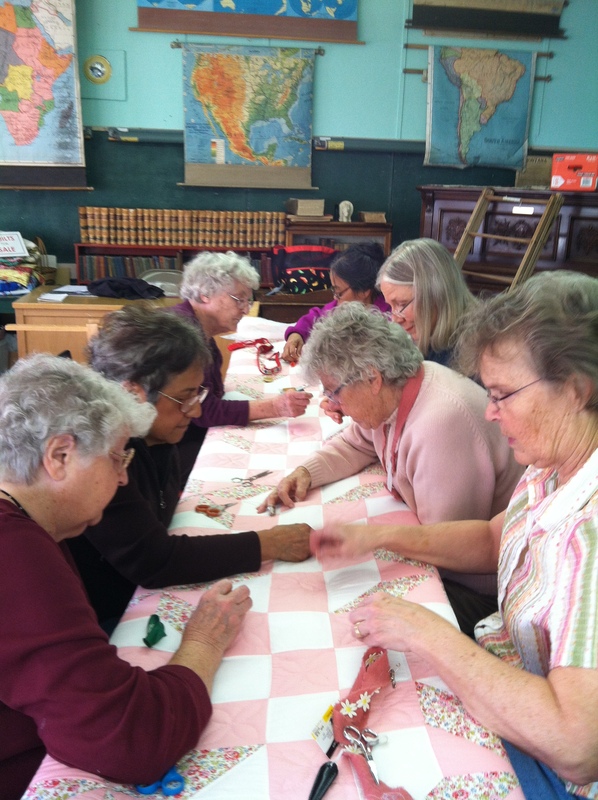 I try to imagine quilting in solitude as I am only ever there when the old school room is filled with other quilters. Cathryn told us when she took the quilt off the frame and turned it over to look – where all our mistakes would be visible on the back – she found nary a one. She remarked how she couldn’t tell who had stitched where. I must admit a certain amount of pride as I always suspect that my stitching is the worst. Knowing that my stitches blend in with the others brought me a sigh of relief. I suppose it comes back to the idea of community – a concept that I mull over often these days. I attend what feels like more than my share of meetings. I am fairly social and my work as well as volunteering puts me in touch with many people in the valley. Often I hear grumbling about lack of jobs (or jobs that pay well), pot holes, a dearth of community leaders and apathetic youth. Yet at the same time I see the Community Soup Night going into its third year run entirely by voluntary efforts. The animal shelter had its annual fundraiser last week with fantastic turnout. And the local Girl Scout troop meets in the building where I work and I am always impressed by the work of the leaders and the enthusiasm of the girls. Obviously there is a sense of community even when we think that it isn’t enough. Could we ever have enough? I try to imagine what a strong community would look like with enough leaders and enough volunteers, enough congeniality even when people disagreed on issues. Maybe it would be like the back of the quilt where one couldn’t differentiate between who had sewn where; just the recognition that the job which had taken months had been done well.